Thinking about stop running over the winter months? Don't! Here's how you get the most out of the cold season and keep improving despite the cold. Winter can be really beautiful. Snowy landscapes and skiing down the slopes in the mountains is great but winter in the northern hemisphere comes with some challenges for us runners. Shorter days and nasty weather lower motivation and the usual winter slump starts. But winter doesn’t need to be a wasted time of the year as far as running. With this article I’d like to put a complete guide into your hands and teach you how you can use winter to keep improving some aspects of your endurance running. Extreme conditions come with some dangers. In summer it is mainly heat and humidity that makes running harder. Winter training brings along a set of different challenges but each can also be seen as an advantage. Temperatures in winter can drop below 0° Celsius (32° Fahrenheit) which is not the kind of climate humans feel particularly great in. When it’s really cold outside you need to somehow keep your body warm. One thing to look at are warm clothes of course but constant movement is probably the most important thing in winter. You should avoid long breaks during your winter runs to avoid cooling your body down too much. When you sweat and you stand still and maybe it’s even windy, your body can cool down quite rapidly. So try to go running on trails where you don’t have to wait to cross a street for example and have to wait for the traffic light to turn green. But there are also some benefits of colder temperatures. When it’s hot, speed training is quite hard and your head might feel close to exploding because of the heat. Also your running is not as efficient in the heat. Winter is quite a pleasant season for intense training sessions. Depending on how far up north you live, days are very short in winter. If you have a regular 9-5 job you might be forced to conduct your workouts in darkness. When you run next to streets with lights you probably see enough and don’t need to carry along a light source yourself. But still some caution is needed because the light and the shadows are different compared to sunlight. Also when it‘s raining the reflections of bright lights in the water can be irritating. When you go running on trails or in the wood you need to carry a headlamp to see where you put your feet. Even on bright and clear full moon nights often it’s not enough to see obstacles on the ground that you can trip up on. So check your headlamps batteries before you go running or carry some extra ones. Not only the weather and the lighting change in winter but also the surface you run on. It can be very different to run on snow. If there’s a lot of new snow you can sink in quite deep and running is very exhausting. If the snow is old and hard and pressed by a lot of runners and walkers it might become slippery and you don’t have a good grip. And then there’s snow mixed with water that is usually a guarantee for wet feet. It gets pretty dangerous when rain is frozen over night and you have some icy places on your run. Especially if you’re running fast this can lead to slips and quite bad and painful falls. So be extra careful and try to make small steps and land with your foot right below your center of mass. When temperatures are colder the body doesn’t need to cool down itself that much. That results in less sweating and a lower loss of fluids. However it’s still important that you keep a balanced hydration level. So don’t just leave your water bottle at home completely. You still need to drink during winter especially on longer or intenser runs to balance out your hydration level. Lack of motivation is a very common thing among runners in winter. I also need that extra push on cold dark days to go outside for a training run. But remember that you can make great use of the winter and improve a specific aspect of your running in the winter months. Check out how you can set a different training focus in the cold time of the year that will improve your running for the coming season in the next chapter. Don‘t stop running in winter, just shift your training focus! A lot of runners hang up their running shoes in winter and take a time out from running and get back when spring arrives. But usually for every week without running you need two weeks to get back at the level you had before stopping. So unless you want to start at zero, you should try to maintain your fitness level. Also winter and a reduced overall mileage gives you the chance to set a specific focus and improve your running with other forms of training. I’ll try to give you five examples on how you can spend your winter to build a strong foundation for your next running goals. There’s time for training and there’s time to give your body a rest. I recommend to take some time off running every year to give your body time to recover completely from an intense running year. Since I can’t go for more than two weeks without running, my recovery is more „active“. But still the time spend with running is less than in the other seasons and winter is perfect for that. Over the coldest 2-3 month of the year I often try to focus more on recovery activities like going to the Spa or taking a good massage. I call this maintenance mode where I don’t improve my speed or endurance but keep running just as much to maintain the form I had after the running season in fall. Another great thing to do in winter is strength training. You can decrease your mileage and don’t do any too intense running workouts but instead invest your time in strengthening you leg and core muscles. For me winter is perfect to build a strong foundation I can build upon as soon as spring arrives. And that means investing in injury prevention and increasing stability and resilience of my locomotor system. Basically I set two focuses when it comes to strength training for running. First I train what I call the suspension chain which involves all the muscles from your feet over your calves, quads, hamstrings right up to the glutes. Second I build core strength by training lower back, abs and overall upper body muscles to maintain a proper running form in longer runs and races. When you don’t train for big running improvements you have time for experimenting. I strongly recommend you to try out new things every now and then. Everybody is different and trying out stuff can give you a hint what might work for you and what doesn’t. So far I suggested things to do that will have a positive impact on your running but aren’t running workouts. But you can also set a specific running focus in winter to prepare yourself to achieving your running goals in the running season to come. Often runners try to build base endurance in winter to get ready for more intense training sessions in spring. You can achieve this by doing long runs at a low to moderate intensity. Usually base endurance is built by one long run over 1.5 hours. If you set this focus in winter, try to do two of these workouts each week. With an endurance focus you’ll work mainly on improving your metabolism and rest your joints compared to speed workouts. Also you can easily build endurance with cross training like cycling or swimming. What I’m currently trying this winter is to build up my fitness or my pace and aerobic capacity. In my regular training I don’t do more than one speed or intense running workout each week. For most runners I wouldn’t recommend more unless you’re an experienced runner. However when you cut back your overall mileage and want to focus on speed you could do two speed training session each week. As stated before the cooler temperatures make running at a hard pace a bit easier. If you work on speed over the winter with two intense runs a week try to build in a rest day after every intense run and have an eye on any injuries or overtraining. Also try to mix things up and don’t do the same workout twice a week. For example you could do a tempo run on Wednesday and an interval training on Saturday. In the last part of this post I wanna focus on the equipment you should use during the cold winter months. Especially the clothing needs a bit more attention and is not just about wearing a shirt and shorts. In the summer months one usually tries to wear as less textile as possible without being a harassment to other runners (please don’t go running naked). When it’s cold you need to wear clothes that keep you warm. But don’t just dress for the temperature and weather, also bear in mind that high intensity training heats your body up much more than a moderate workout. The upper body clothing in winter is all about layers. The first layer, or base layer, is usually a thin, tight shirt. Use materials that transport your sweat away from your skin to the outside to keep you warm. The second layer is usually a sweater that isolates well and therefore keeps you warm. I normally use a sweatshirt with a long zipper so i can regulate a bit how much cold and fresh air comes to my body. Sure you can use a regular sweatshirt, but I recommend you to use a specific product for runners. First this is because of the thermoregulative materials but also for the special features like zippers that don’t chaf or small pockets to carry energy gels or other stuff. These two layers are usually what I wear around 0° C (32° Fahrenheit) in dry weather. When it’s colder I put another layer on top. That is a jacket, either a thin windstopper or a rain jacket depending on the conditions. For me the lower body clothing is pretty simple. When temperatures go below 10° C (50° Fahrenheit) I put on long tights. When it’s not that cold you could also use ¾ tights but I don’t have any of those. I use shorts or long tights and maybe shorts with long compression socks. You could also do some layering on your lower body. There are pretty thin tights out there that you can use as underwear and put some shorts or sweatpants on top. I don’t do anything special on my feet in winter. Usually cold feet when running is something that doesn’t happen very often as long as they stay dry. If you’re running in deep snow or slush your feet can easily get wet and you should consider using gaiters to avoid too much water in your shoes. As far as accessories I wanna mention three things here that I regularly use in winter. The first thing is a headband or a thin running cap to keep your ears warm, especially in windy conditions. Personally I like to use a Buff that can be used as a headband, mask or neckwarmer. Be aware though that most of the heat of your body is lost over your head. So only use a cap when it’s really cold. The second accessory is gloves. Normally I get cold hands pretty fast. But still I use gloves only when it’s below or around 0°C (32° F). As with any other running clothes you shouldn’t dress for the first 10 minutes of your run but for the majority of your workout when your body is warmed up. So thin running gloves should be enough for most runners even in very cold temperatures. The third thing is a headlamp. As days get pretty short depending how far up north you go running, lighting up the ground on which you plant your feet is a must to avoid a fall when you go running on trails or in the woods. Obviously you don’t need a lamp when you are a road runner and your roads are well illuminated. That’s about all that popped in my mind regarding winter running. Do you miss anything or have open questions? Just drop be a mail or use the comments section below. I’m also always curious about your approach on things. Let me know how you spend winters running wise. If you like what you’re reading here, make sure to share it with your friends and sign up to my mailing list to get new posts right into your inbox. 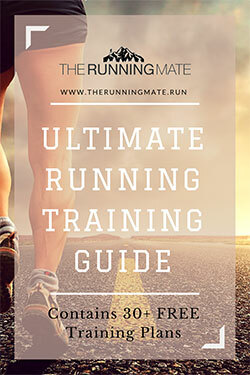 Along with the ultimate endurance running training guide!